Have you ever opened yourself up to a new experience, unsure of how it might turn out but willing to look past first impressions, to allow the more significant aspects to surface? This is the fun that awaits you with a visit to Autry Cellars. 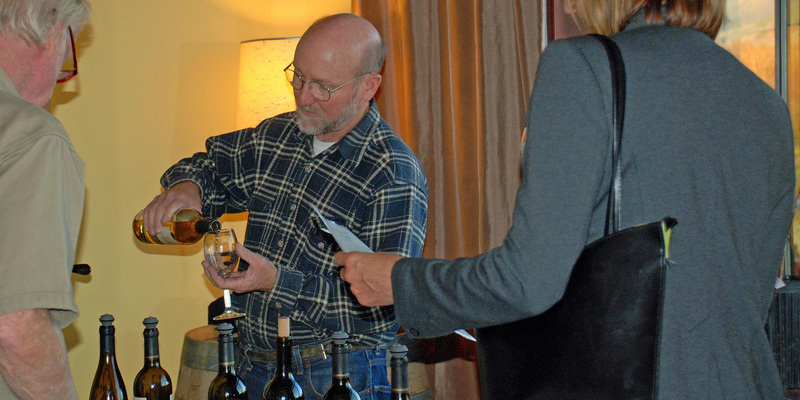 Steve Autry pours his award-winning wines (photo courtesy Autry Cellars). If a jet flies overhead on approach to San Luis Obispo Regional Airport, winemaker Steve Autry may take you to the deck outside the tasting room. As the aircraft passes over, you may think that’s cool enough to be at a winery on the flight path. Wait another few moments, though, and you’ll be rewarded with something few ever hear—the soundwaves crackling in the air wake behind the jet. And it’s a good bet that if you ever do hear this remarkable sound elsewhere, it probably wasn’t a winemaker who invited you to experience the science of sound. But Steve Autry is not your everyday winemaker. His journey to creating the handcrafted wines at Autry Cellars in San Luis Obispo began with science. Not the science of viticulture or viniculture… the science of aerospace research. This, combined with his musical talent as a bass player and passion for both great wine and engineering creative solutions, has led to his award-winning, small production winery. From his previous career in aerspace, he bring a curiosity of how things work, a thirst for creative solutions, and a scientist’s rigor and fascination with gauging the effects of small changes on the outcomes of an approach. During a tasting of his wines created from grapes grown on some of the best wineries, you may get to watch a stage of wine production—punchdown or press, perhaps, depending on what’s going on at the winery. With just himself, daughter and co-winemaker Kristen, and weekend tasting-room attendant Doug, its’ a small hands-on winery, where Autry orchestrates all the pieces of production. Another thing that sets Autry apart is his penchant for creating a better mousetrap and looking beyond the industry conventions for solutions. For example, white wines need a lower fermentation temperature than red wines. Wineries typically accomplish this with expensive glycol-jacketed tanks. Autry knew what the end goal was—keeping wine at a certain temperature during fermentation—so he created a new way to achieve that. His cooling area is built from rigid insulation panels and ice. Once the must is chilled to its ideal temperature, it doesn’t take much ice to keep the chamber cool. Another example: he’s creating a line of grape-based distilled spirits. Typical distilleries would use mass-produced machinery. Autry designed and built his distillery using common parts and building in additional functionality. These are just two of the refreshing ways Autry Cellars differs from many of its Edna Valley neighbors. If you’re looking for a wine tasting experience that’s more about what’s in the bottle and moving beyond the idea that a fancy tasting room is a requirement for quality wine, we encourage you to try it for yourself. You’ll get to taste some good wines, and learn a little science in the process, whether it’s the science of winemaking—or soundwaves. We hope you enjoy this slice of a day-in-the-life at Autry Cellars, when the 2017 Merlot began its transformation from bin to bottle under the direction of Steve Autry and daughter Kristen.